There’s no way I’m staying up for this one — too long a week for me and I have to get up way too early. In fact I may not make it to the opening pitch. That said, please feel free to post your thoughts below, both during and after the game. Considering that the Dodgers have lost 8 of their last 9, were just shut out three consecutive times, and they’re without both Matt Kemp and Andre Ethier, I’m going to go on a limb and predict at least three wins for the Mets in this series, but my gut is figuring on a sweep. We’ll see what happens. Perhaps lost in the excitement of Jose Reyes joining the Miami Miracle is the fact that a few days earlier, the Mets also lost Chris Capuano to the Los Angeles Dodgers, who signed the lefthanded starter for 2 years, $10M — which was about 1 year and $8.5M more than the Mets could afford. NOTE: this is a post by Corey Gorey. Please direct your comments to him. How many days in a row will I wake up, check out the blogosphere, scan the standings, and wish this 162 game baseball season would end? Sure, it’s only July, but Bud Selig is not the boss of me. If I followed my own advice and remembered to forget about the legitimate end date to the 2011 schedule, I would be much happier right now. At many points during the past few months lying to myself would have been a viable alternative to—what do they call it? Reality? Considering how many pundits were certain the Mets would find themselves in the NL East basement from the get-go, I’m nearly satisfied with mediocre. If the season ended today we wouldn’t have won anything—no multi-pronged trophies to encase, flags to hoist, or ostentatious rings to flaunt—but I sure as hell wouldn’t feel like I was squandering any more time or emotion, either. 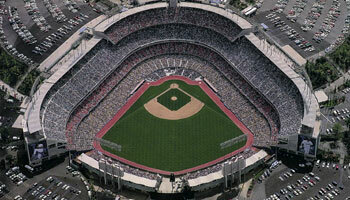 And when it comes right down to it, isn’t the MLB all about me, the fan? 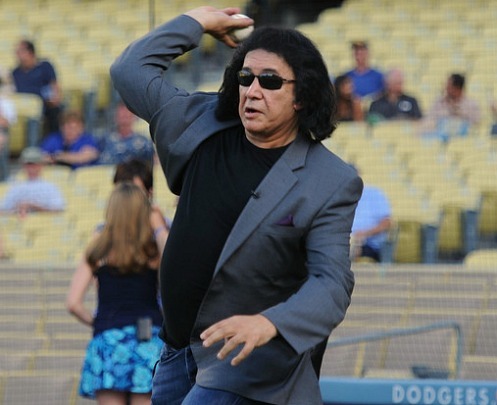 Before the second game of the Mets’ most recent trip to L.A., Gene Simmons of KISS threw out the ceremonial first pitch for the Dodgers. Unfortunately, the 61 year-old bassist didn’t do it in his ghoulish whiteface makeup and platform boots, but despite throwing a strike he still managed to look monstrously tall and slightly inhuman perched on the Dodger Stadium mound. Celebrities are offered this honor fairly regularly without much thought to any possible team allegiance they may harbor (and this might be especially true in La La Land), but as a die-hard fan of both the Mets and KISS, my elation at a 6-0 win dissipated as I angrily clicked through a photo series of Gene tossing the ball. Understand that this rage goes beyond a desire to ensure my childhood obsessions simply toe my own idiosyncratic party line. It’s like this: he’s from Queens and should act accordingly. Where is the hometown pride? In actuality Gene was born in Israel as Chaim Weitz and immigrated to the States in 1957 at the age of eight. Does 1957 remind you of anything? Yes, it’s the same year the National League team from Brooklyn went Hollywood and left its followers bereft of joy, ruining their summers for at least another five seasons before the Mets arrived to play second husband. So although Gene wasn’t born in Queens, he grew up there. As a teen, The Beatles’ first TV appearance on Ed Sullivan in 1964 served as the impetus for his obsession with rock ‘n’ roll; so the following year he would have been aware of their historic concert at the recently constructed Shea, a mere two miles east of his high school in Elmhurst. Whether or not Gene noticed the Mets, he probably guessed they built the stadium for other uses besides the lone Beatles show. (Coincidentally, if you ever want to blame the luck of our franchise on someone, pick the person responsible for sending The Fab Four to use the Shea away team’s locker room.) Not that anyone would ever accuse him of levelheaded choices, but Gene should have had sense enough to distance himself from Chavez Ravine, and acknowledge the borough where his lifelong cash cow of KISS was born by demonstrating a shred of attachment to his old stomping ground and the team that represents it. On the other hand, since Gene’s lived in the Los Angeles area for years, maybe he’s really come to identify with the area. Besides constantly touring and recording with KISS dating back to the early 70s, he became a B-movie Hollywood actor in the mid-1980s, and is fully entrenched in television production, while also starring in his own reality program, Family Jewels. Like most Dodgers fans, I’m perfectly aware Gene could probably care less about baseball. If anything, he probably identifies with the Dodgers as former New Yorkers; like him they’re now a southern California-based institution, transplanted decades ago. It doesn’t sit right with me, though. If you grew up in Queens, then technically as someone from Queens you should be a Mets fan, right? Unless of course you’re one of those hateful aberrations of humanity who supports the Yankees even though you regularly buy your auto parts in the shadows of the Citi Field lighting racks. Speaking of hateful behavior, Gene’s mother was a Nazi concentration camp survivor; she subsequently fled to Israel, where Gene recently returned for the first time in over fifty years. With his family and reality show camera crew in tow, he had an emotional homecoming. He met some estranged half-siblings he never knew existed, and recognized that despite his unwavering American patriotism he always felt like an outsider, which he’s now attributed to his long-ignored Israeli background. What Gene should realize is his self-consciousness was impacted by not only living in L.A., but because he’s forgotten about Queens. This has to change. Next season’s Family Jewels needs to shoot in Flushing, with the Wilpons taking Gene on a nostalgic tour of the Fan Walk, escorting him up to the Promenade level to feed him a kosher pretzel, and naggingly reminding him that his longtime partner and fellow KISS founder, Paul Stanley, also moved to Queens as a teenager. As long as no one mentions the Ebbets Field-inspired design or the fact that Jackie Robinson was never on the Mets, it should be a real heart-wrenching episode. NOTE: this was a post by new MetsToday contributor Corey Gorey. You can read his bio below. As Meatloaf might have sung, had he recorded a follow-up tune — three out of four ain’t bad. Look at that: newly promoted Nick Evans is slotted into the starting lineup right away. Good luck, Nick!